In this article, we will go over how timers work in Node.js. We will also introduce how the Node.js event loop works and how you can take advantage of Node's event handling capabilities. The first set of utilities we will look at are the setTimeout, setImmediate, and setInterval timing utilities. With these tools, we can control the timing of code execution. Why would this be important? In Node.js, similar to when using other programming languages such as C, Python, Java, and others, it helps to schedule certain functions to run repeatedly. Suppose, for example, we want to copy certain files from a receiving location to a permanent archive. This would be a good scenario for scheduling a file transfer. At certain intervals, we can check for new files, and then copy them over to the backup location if there are any. With setTimeout, we can schedule code to be executed after a certain length of time has passed. Notice how even though the console('An exploration...') call is after our console.log(cue) call, it is still executed first. The trick to realize here is that the code is only guaranteed to execute after at least that length of time has passed, not right on the dot. In situations where you need repeated, regular, code execution, such as long polling, then setInterval method will be a more natural fit than setTimeout. With this function, we can specify a function to be executed every X seconds. The function actually takes its argument in milliseconds, so you have to do the conversion yourself before entering in your arguments. Suppose we want to check the length of the queue at a McDonald's drive-through so users of our program can dash out at the best time. Using setInterval, we can repeatedly check the length of the queue and tell them when the coast is clear. You can see the output below. Run the code with node setInterval.js, as shown below:. The queue at the McDonald's drive-through is now 6 cars long. The queue at the McDonald's drive-through is now 0 cars long. The queue at the McDonald's drive-through is now 1 cars long. The queue at the McDonald's drive-through is now 3 cars long. The queue at the McDonald's drive-through is now 9 cars long. This is beginning to look impossible! The queue at the McDonald's drive-through is now 10 cars long. If we'd like a function to be executed as urgently as possible, we use setImmediate. The function we execute this way will execute ahead of all setTimeout or setInterval calls as soon as the current Node.js event loop has finished calling event callbacks. I am a normal statement in the event loop, guess what comes next? The setImmediate callback, though defined after those for setInterval and setTimeout, will run ahead of them. A question that might have occurred to you is "How does Node.js keep track of all these times, timers, and events? How is the order of execution prioritized?" This is a good line of inquiry and necessitates looking at something known as the "Node.js Event Loop". So, what is the Event Loop? The Event Loop is simply a repeated cycle by which Node.js switches through processing of computations. Since it cannot conduct all possible computations simultaneously, being single-threaded, it switches from computation to computation in a well-defined loop known as the Event Loop. The Event Loop is the backbone of working with events and other asynchronous callbacks in Node.js. It allows us to lay hooks at certain points that will be hit in the course of the loop. Given the single-threaded nature of Node.js, long-running operations such as file reads or database queries are quickly offloaded to the operating system, then Node.js continues its Event Loop as normal. This keeps things efficient and fast. How do those operating system processes interact with the Node.js process? Through the means of callbacks. We use a callback to asynchronously process things in the background, then hook back into the Event Loop once the asynchronous job has completed. To get this kind of functionality in other programming languages, you might use a task queue like Celery in Python or Sidekiq in Ruby. In Node.js, because the Event Loop and the asynchronous execution of Node.js already queue things up for you automatically, you get this asynchronous processing for free. To see callbacks in action, we are going to read a file from the filesystem and use a call back to print out the contents. The first step is to create the file. In this case, we are using a text file, containing the lines to a poem by T.S. Eliot. You can substitute your own file. This file is named poem.txt and you can place the following contents into it. In the same directory, we will create our script that will read this poem file and print it back out. Printing the file or handling an error will be accomplished for us in a callback, after the operating system returns the result of the file read. As shown below, in readFile.js, your callback gets triggered after the asynchronous operating system process returns. When this OS process returns, the Node.js callback you provided is placed on the event loop to be processed, which will then get executed when the loop gets to that process. Your callback can then do anything from updating state in the application, to handling an error, if any, and logging the user out, doing nothing, or even terminating the Node process entirely. Run this code with node readFile.js. The file will be read and the console should print the poem back to you. If not, it will print out the error that was encountered, for example, if there is no such file at the specified path. Callbacks are suitable for one-time handling of data, errors, and events. However, callbacks can get complicated when they are nested several levels deep. Another alternative way of handling events is to use Event Listeners, which are covered in the next section. Event listeners are functions that get to run when specific event types occur. For example, when reading a file, making a server connection or querying a database, the modules that we make use of, such as fs, net, or mongoose, all have built-in event types that they will emit. The objects that typically emit these events extend the base EventEmitter object, which comes from the built-in events module. Your application can respond to these events through the mechanism of event listeners. Typically, you attach an event listener in code through the means of the keyword "on", followed by a string specifying the event type, and then finally a function, which is the code to run when the event occurs. To see event listeners in action, we are going to create a server that interacts with a Cat API and parse responses from the API. Our server will then serve requests and show visitors a "Cat of the Day" image. The events we will be working with are part of the http module. We will also be using a xml2js module to parse the XML responses that the Cat API produces. To install xml2js, you will want to run the command npm install xml2js in a suitable project directory. Once you have installed the module, create two files in the directory, cats.html, and cats.js. 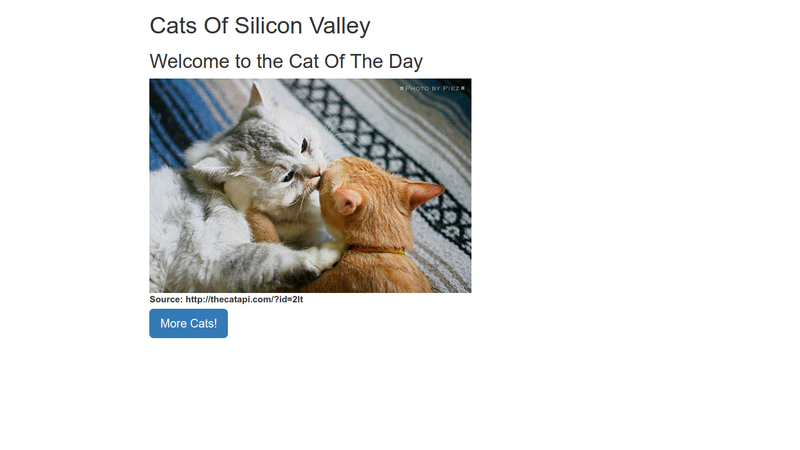 Inside cats.html, place the front-end of our application. This will simply display the cat data we are going to be parsing. The bulk of our logic is going to be in the server-side code that works with the event listeners. This is contained in the cats.js file. To see the event listener code in action, place the following code inside the file, then run it with node cats.js, and, in your browser, visit http://localhost:4000. Below, we go into the code in detail. Also take a look at the comments in the code. As you can see from the code, our request to the Cat API requests new cat data. We then let Node.js execution continue as normal. However, we attach two event listeners to deal with new events from the remote API. The first of these is an "on end" event listener. When we have a complete cat payload from the Cat API, we then update our page with the new data and image. The second class of event we are listening for is the "data" event. This is triggered when there is new data from the remote host. In that case, we buffer up the data and add it to our temporary data store. Now, thanks to the power of event listeners, we've made it easy to get new cat images at will. Our website visitors can get new Cat of the Day images at the click of a button. There's a lot more to events and timers in Node.js than what we described here. A good next topic to explore is that of event emitters, which give you even more power over the kinds of events your application can make use of.